S wind around 15 kt, with gusts as high as 23 kt. 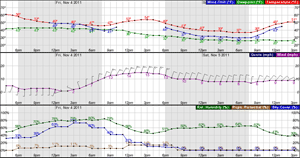 Areas of drizzle before noon, then a chance of rain or drizzle between noon and 3pm, then a chance of showers after 3pm. Areas of fog before 3pm. Seas around 3 ft.
S wind 14 to 17 kt, with gusts as high as 24 kt. A chance of showers, then showers and possibly a thunderstorm after midnight. Some of the storms could produce gusty winds and heavy rain. Patchy fog before 2am. Seas around 3 ft.
SSE wind 14 to 17 kt decreasing to 11 to 14 kt in the afternoon. Winds could gust as high as 24 kt. Showers and possibly a thunderstorm. Some of the storms could produce gusty winds and heavy rain. Seas 3 to 4 ft.
S wind 12 to 15 kt decreasing to 8 to 11 kt after midnight. Showers, mainly before 3am. Seas around 3 ft.
S wind around 9 kt. A chance of showers. Seas 2 to 3 ft.
SSW wind 5 to 8 kt. A chance of showers. Seas around 2 ft.
SSW wind around 8 kt. Scattered showers. Seas around 2 ft.
SSW wind around 7 kt becoming WNW after midnight. Mostly cloudy. Seas around 2 ft.
WNW wind around 8 kt becoming S in the afternoon. A chance of showers. Seas around 2 ft.